You are here: Home / Wedding / Wedding Wednesday-They’re Engaged! Today we are starting a new series here at The Mom Maven, Wedding Wednesday. We are in the midst of planning a wedding and the happy couple is allowing me to bring you along for the ride! It is my hope that through this series you will get to know us a little better and see what we did to put on a wonderful wedding on a shoestring budget. 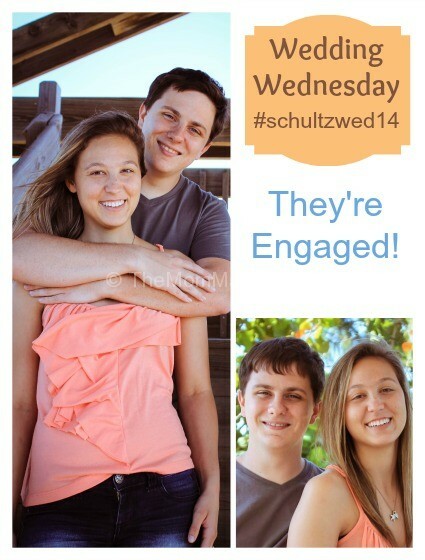 You might want to start by following the wedding hashtag #schultzwed14 and Pinterest Board to stay in the loop or just subscribe to my blog so you don’t miss an update. Follow Cindy Schultz-TheMomMaven.com’s board Ideas for Aaron’s & Summer’s Wedding on Pinterest. A little back story on the happy couple. Aaron, my oldest son (21) met Summer (19) several years ago at church youth group. They have been friends a looong time. I have mentioned before that we raised our boys with a no dating policy. It is our belief that dating is preparation for marriage and relationships should not be entered into until you are 2/3 of the way through your professional education and you are financially able to settle down. Fast forward a few years…in February of 2012, Summer moved into our home full time due to some family issues. We turned what was our homeschool room into Summer’s bedroom and she has lived with us ever since. In February 2013, Aaron and Summer presented my husband and I a long and compelling letter as to why they feel they are ready to begin courting. We agreed and presented them with a courtship contract that outlined specified behaviors and requirements of their courtship, to which they agreed. Me: Are you 100% sure about this? Did you ask her dad’s permission? A while later I received a picture of the ring on her finger! Aaron proposed out at Robinson Preserve on the tower and Summer was completely not expecting it! Since we have 2 boys, we do not have a wedding account for them and unfortunately, neither does Summer’s family. Our goal is to help the kids host a wedding for 120 guests on a $4000 budget. The wedding date is set for Thanksgiving weekend, November 29, 2014 so follow along with us on our journey. Congrats! “Financially ready to settle down” before getting married is very good motherly advice, too. My fiance and I are quite a bit older but working with a similar budget to plan our wedding. Can’t wait to see how your family does it! Congrats on your upcoming wedding!! Thanks for reading, I hope you find some helpful hints. Congrats to the happy couple! And thanks for linking up at On Display Thursday. How awesome! Congrats to the happy couple. Weddings are awesome!